Spend 3 days exploring the beautiful areas of Monteverde and end up in Arenal. 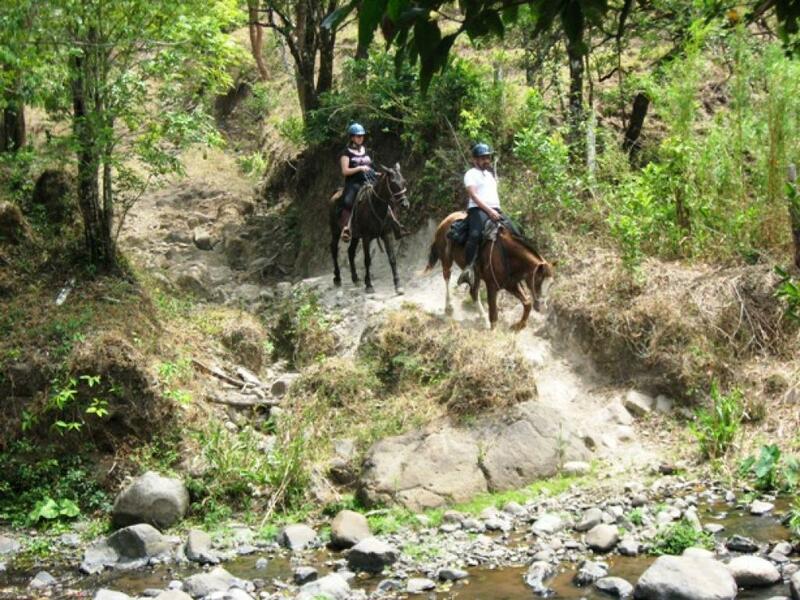 Enjoy the thrill of riding Costa Rican style on our healthy and well-trained horses. 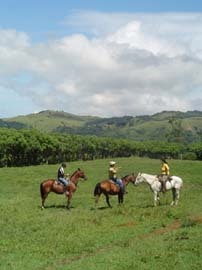 This trip is designed for anyone who loves horses and riding and wants a unique way of seeing Monteverde. The riding is in Monteverde, followed by a taxi-boat-taxi transport to get you to Arenal, where the tour ends. Our trip starts in Monteverde and finishes in La Fortuna the nearest town to the volcano. This package does not include transportation to Monteverde or onward from La Fortuna. We can easily arrange such transportation for those interested or you can make you own way to Monteverde and then on to the beach or someplace after the trip stops in La Fortuna. Included on Trip: 2 nights' accommodation (both in Monteverde). The first night we use Hotel Rustic Lodge or Monteverde Villa Lodge, whenever possible. These are friendly, family run B&B located a 5-minute walk to Santa Elena, where you will find various restaurants, shops and services. The second night we use Cabinas Belcruz run by a delightful Costa Rica family who have a beautiful hummingbird garden and lovely wooden cabins with great views of the mountains. Note we can change hotels for an extra charge. We are very flexible. All transportation is included from the time the tour begins in Monteverde, until the time it stops in the town of La Fortuna. Local Horse Tour: Afternoon ride about 2.5 hours plus transport time. We can help you find a hotel in Arenal. It is also possible to add another night in Monteverde and to include a guided visit to the Monteverde Cloud Forest Reserve. We are flexible and able to meet your needs and schedule. If you want any more information regarding Monteverde or any place in Costa Rica please don’t hesitate to write again. We can also arrange forest hikes, canopy tours, night hikes and also many adventure tours in Arenal such as rafting. We need your riding experience please put below in the Additional Info section. Our trip starts in Monteverde. The mountain paradise settled in by Quakers some fifty years ago. When you are ready to start riding (no later than 2.30 pm) we will pick you up at your hotel for a gentle ride of about 2.5 hours. 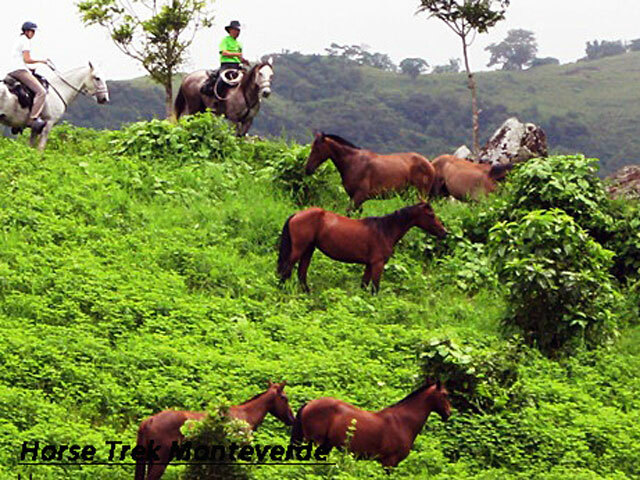 This ride is organised with the owner of Horse Trek Monteverde or one of his guides, on well-trained and well-cared for horses. Marvin is a great character and a fantastic rider. There is little he does not know about horses in Costa Rica. He claims to have started riding before he was born as his mother used to ride pregnant! By 8 years old he was training many of the horses in the area and his love of horses is evident. The ride will be along little used back roads. passing by farms of coffee, sugar cane and bananas. You will see wonderful views of the pacific coast and forests. If you are a horse lover than you are going to love this tour! It is great value and a wonderful experience. You'll start off by helping to prepare the horses (or we'll just have the horses ready for you) and learn how we saddle up in Costa Rica and see the type of equipment we use. After getting the horses ready you'll set off for an all-day excursion. The route used to get to the small farm owner by Marvin and his wife, Janet Ellis, is only accessible by horseback for many months of the year. The journey to the farm passed some amazing scenery and you'll definitely need your camera! A picnic is provided by the river side where monkeys are often hanging around cooling off in the trees and many birds. There is plenty of opportunity to swim in the river and just relax, before setting off again in a different direction to pass through some more farms in the area. As the zone is hilly the views points are simply stunning. After the tour, you will be dropped off at Cabinas Belcruz and Randal the owner, will happily talk about his hummingbird garden. In the evening, you will be served a delicious homemade meal. Morning: 4 hour ride starting around 9.00am Pretty route with lovely views, riding along the Continental Divide in places. We will arrive back at Belcruz around 1.00pm for lunch. At around 2.20pm a shared van will pass by Belcruz for your 1.5-hour drive down to Rio Chiquito. 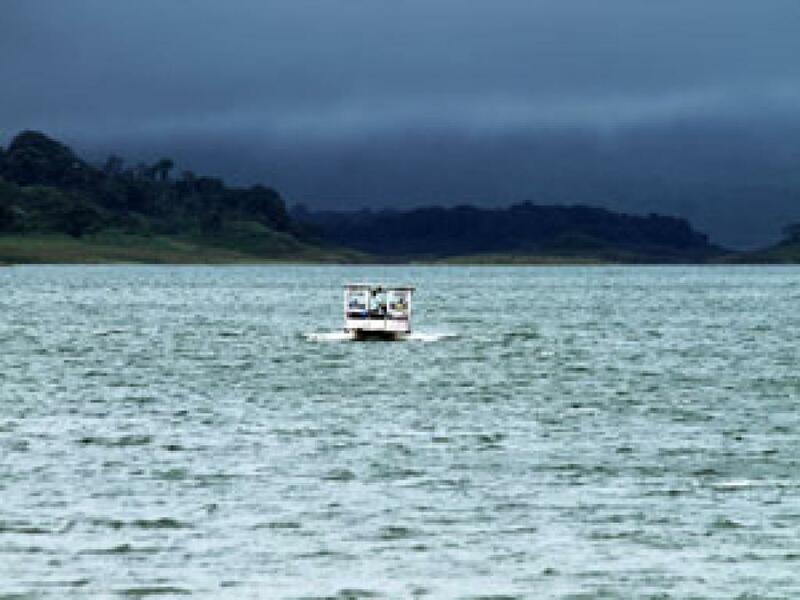 Here you will take a covered boat for 30 minutes to cross Arenal Lake. Then you will take further land transport to La Fortuna, around 30 minutes. 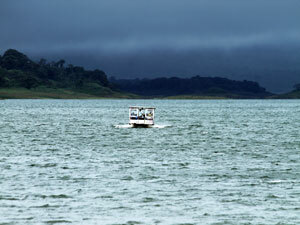 The transport can stop at hotels along the way from Arenal Lake to the town of La Fortuna. You will arrive at around 6.00pm. In the evening, there are optional Hot Springs to visit.